Stephen Rex Brown The poet at work. 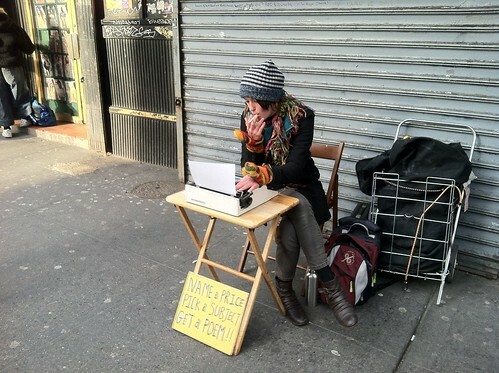 A 20-year-old itinerant poet was offering up stanzas on the cheap today, and she even penned an ode to St. Marks for The Local. 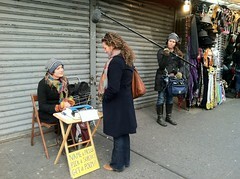 Abigail Mott had set up at St. Marks Place and Third Avenue with a typewriter and a sign saying, “Name a price, pick a subject, get a poem.” A four-person film crew shot her every move. Stephen Rex Brown A film crew was shooting a documentary about the poet. Since arriving at 1 p.m., Ms. Mott said she’d written poems for seven people. The director of the documentary about the poet, Barrett Rudich, became enchanted with her after soliciting a poem about ambiguity outside of a Portland, Ore. bookstore. “I was totally intrigued by it — the poem was really good, too,” said Mr. Rudich, who will follow Ms. Mott to New Orleans on Wednesday. Of course, The Local couldn’t leave without getting a poem of our own — which is reproduced below.